The Florida Law Prohibits Discrimination Poster is an equal opportunity law poster by the Florida Department Of Economic Opportunity. This is an optional poster, so while it is recommended that you post this if it is relevant to your employees, you are not required to by the Department Of Economic Opportunity. This poster, written in English and Spanish, is optional to post and describes the basis on which employers cannot discriminate on and what specific sections are covered under this law such as employment, public accommodations, retaliation after filing a claim, and state employee whistle-blower retaliation. It appears you don't have a PDF plugin for this browser. 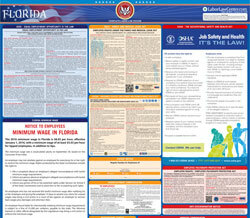 Please see the link below to download florida-discrimination-poster-11x17.pdf. visite nuestra página web o llámenos!